President Hassan Rouhani said on Sunday Iran had plans to respond to any move by President Donald Trump on the 2015 nuclear agreement and the United States would regret a decision to exit the accord. Trump has said unless European allies rectify "flaws" in Tehran’s nuclear agreement with world powers by May 12 he will refuse to extend U.S. sanctions relief for Iran. 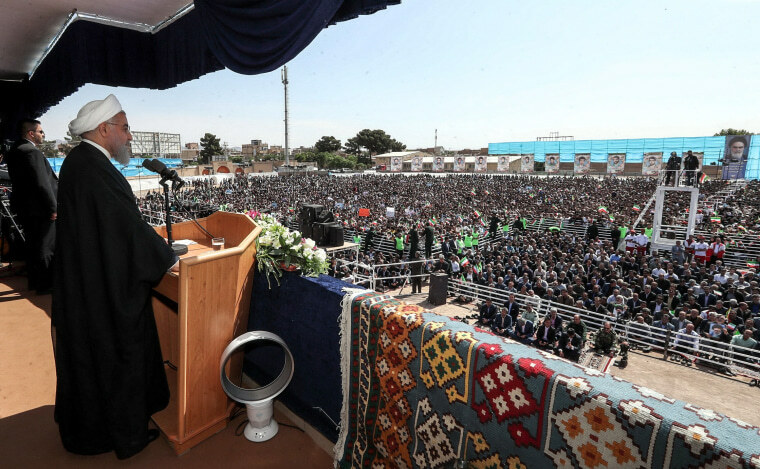 "Orders have been issued to our atomic energy organization ... and to the economic sector to confront America's plots against our country," Rouhani told a rally in northeast Iran. "America is making a mistake if it leaves the nuclear accord," Rouhani said. Britain, France and Germany remain committed to the nuclear accord but, in an effort to keep Washington in it, want to open talks on Iran’s ballistic missile program, its nuclear activities beyond 2025 — when key provisions of the deal expire — and its role in Middle East crises such as Syria and Yemen. "We will not negotiate with anyone about our weapons and defenses, and we will make and store as many weapons, facilities and missiles as we need," Rouhani said, reiterating a rejection by Iranian leaders of talks on Iran's missile program which Tehran says is defensive. Also Sunday, Israeli Prime Minister Benjamin Netanyahu accused Iran of supplying advanced weapons to Syria that pose a danger to Israel, saying it's better to confront Tehran sooner rather than later. Israel has repeatedly warned it will not tolerate a lasting Iranian military presence in neighboring Syria, and is believed to have been behind recent airstrikes on Syrian military bases that killed Iranian soldiers, prompting Tehran to vow revenge. Israel has neither confirmed nor denied involvement. Netanyahu told the Israeli Cabinet on Sunday that Iran has delivered advanced weapons to Syria "in order to attack us both on the battlefield and on the home front." "We are determined to block Iran's aggression against us even if this means a struggle. Better now than later," he said. "We do not want escalation, but we are prepared for any scenario." Israel has long viewed Iran as its biggest threat because of Tehran's nuclear activities, its support for armed groups across the region and its leaders' frequent calls for the destruction of the Jewish state. Netanyahu was an outspoken opponent of the deal, which required Iran to limit its nuclear enrichment in exchange for the lifting of international sanctions. Netanyahu says the deal will not prevent Iran, Israel's most bitter enemy, from reaching nuclear weapons capability. Last week, Netanyahu said a "half ton" of Iranian nuclear documents seized by Israeli intelligence revealed that Iran had lied about its past efforts to produce nuclear weapons. He did not provide any evidence that Iran has violated the 2015 nuclear deal, but said the documents prove Tehran cannot be trusted. European countries, which have been pressing Trump to stick with the deal, said Netanyahu's presentation only reinforced the importance of the agreement, which provides for inspections. French President Emmanuel Macron warned that war could ensue if Trump withdraws from the deal. "We would open the Pandora's box. There could be war," Macron told German weekly magazine Der Spiegel. But he added: "I don't think that Donald Trump wants war."